By now you know how much we love the library. It’s a great resource for families, offering tons of FREE activities for parents of children of all ages. From toddler story times and craft events to teen movie night and magic shows, there is always something fun going on for families to enjoy. Summer Reading Program: The basic idea is that you sign up for the program; you read some books; you keep track of how many you read and then you get a prize. Great way to get kids exciting about reading while school’s out, right? What’s great about this too, is after you complete your sign up sheet, and get your initial prize it’s not over….. there’s a Grand Prize drawing at the end of the Summer. Read more about the Summer Reading program here. 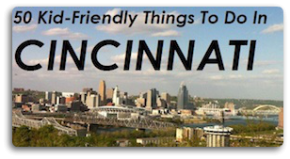 Fun Library Events: In addition to the Summer Reading Program, the Cincinnati LIbrary has tons of cool special events happening throughout the summer. There’s magic shows, a portable circus, kids can learn about bugs (and eat some! ),there’s juggling, music (by Zak Morgan), and even a pirate show. In the past, we’ve been to the magic show and the pirate show and both were excellent and tons of fun! ‘You can view a complete list of events & where they’re taking place, here. Storytimes & Special Programs: Throughout the month the Cincinnati Library hosts a ton of great storytimes & special programs for children of all ages. These are held at branches all over Cincinnati & Hamilton County. We’re including a few here, but you can find a complete list of Storytimes HERE and a complete list of Special Programs HERE. Bedtime Stories: Enjoy stories, songs and rhymes. Tuesday 15, 6:30 p.m., Ages 6 & under. Summer Storytime: Lots of fun stories for everyone! Children’s Learning Center, Mondays 7, 14, 21 & 28, 10:30 a.m., All ages. Baby Massage with Michelle Emanuel Bring your baby and learn calming and bonding techniques to help baby’s development! Saturday 19, 10:30-11:00 a.m. Recommended for parents with babies under 1 year. Registration is recommended. Movers & Shakers Storytime, Wednesdays 9, 16, 23, 30, 10:30 a.m., Ages 1-3. Caring For Your Pet: Puppies & kittens with the League For Animal Welfare. Monday 28, 1:30-3:30 p.m., Ages 5-12 Sponsored by the Hosbrook Fund. Reptile Rendezvous: An up close look at snakes, turtles and more with naturalist Julie Stubbs from Hamilton County Parks. Thursday 17, 2:00 p.m., All ages. Art at Night: Learn about famous artists and discover the artist in you! Create a work of art each week. Children’s Learning Center, Wednesday 9, 16, 23 & 30, 7:00 p.m., Ages 6-12 Sponsored by the Downtown Residents Council. Finally, here’s a cute video the Library put together on their storytime program.